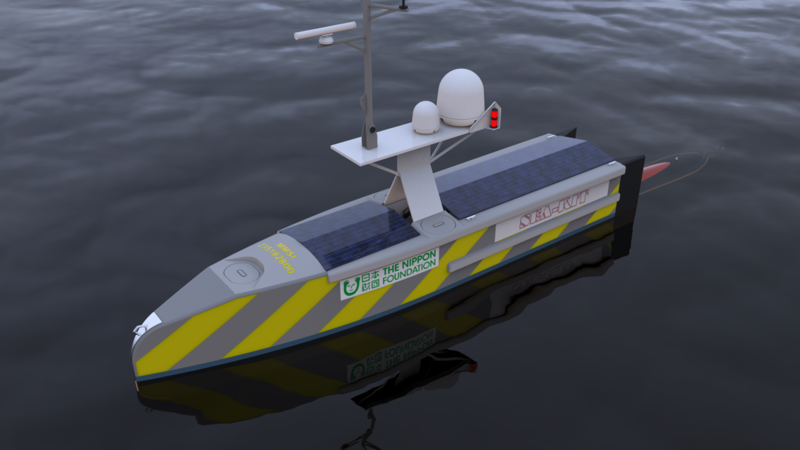 Kongsberg’s latest marine robotics innovation, the new autonomous surface vehicle control system K-MATE, is to be integrated with SEA-KIT, a new class of maritime autonomous surface vessel being built by U.K. manufacturer Hushcraft and operated by SEA-KIT International. K-MATE is the common autonomous control engine to be used by unmanned and autonomous vessels delivered by Kongsberg Maritime, including the fully electric container feeder YARA Birkeland. It has been developed by the Kongsberg Maritime Subsea Division in Horten, Norway in conjunction with FFI, the Norwegian Defense Research Establishment and is the result of a long and fruitful history of joint development projects, including the HUGIN AUV System. SEA-KIT is due to be launched this September. Its first task is to compete in the $7 million Shell Ocean Discovery XPRIZE, a global competition with the aim of advancing deep-sea technologies for autonomous, fast and high-resolution ocean exploration. It will be managed by the GEBCO-NF Alumni Team, led by alumni of The Nippon Foundation/General Bathymetric Chart of the Oceans (GEBCO) Postgraduate Certificate in Ocean Bathymetric Training Program, run at the Centre for Coastal and Ocean Mapping at the University of New Hampshire, U.S. – now in its 13th year. All alumni hold positions in their own countries’ maritime industries. GEBCO is the only organization with a mandate to map the entirety of the world’s ocean floors. The Nippon Foundation, Japan’s largest private philanthropic foundation with a long history of involvement in maritime issues, has agreed to provide more than $3 million to assist with concept development and the design of new technology to be utilised in the semi-final stage of the competition by the GEBCO-NF Alumni Team. The Chairman of The Nippon Foundation, Yohei Sasakawa, recently launched NF-GEBCO Seabed 2030 – with the challenge to map the world’s ocean floors by the year 2030. SEA-KIT has been built by Hushcraft in the U.K. The GEBCO-NF Alumni Team will utilise a HUGIN AUV which has been provided by Ocean Floor Geophysics and the data work flow and data processing development to meet the Shell Ocean Discovery XPRIZE requirements is being undertaken with assistance from Teledyne CARIS.